When Hurricane Harvey, a Category 4 storm, came barreling into Texas at the end of August, leaving thousands without power and homes that would need serious repair, COIT Cleaning and Restoration of South Jersey decided that it was important for their company to help any way they could. And when Hurricane Irma threatened Florida shortly after Harvey at the beginning of September, COIT’s determination to lend their helping hands only grew that much stronger. For the past seven years, one of the organizations close to owner Lori Topiel’s heart has been the Animal Welfare Association (AWA). The AWA is a private, nonprofit, nokill organization that has been an important part of South Jersey for nearly 70 years. The AWA provides rescue, shelter and adoption to nearly 2,000 pets annually, and Topiel has fostered and adopted several of those dogs and cats herself. 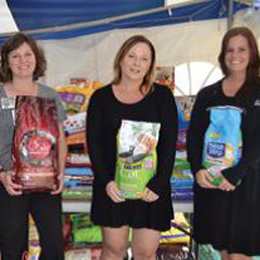 For Topiel, partnering with the Animal Welfare Association’s efforts to give back to those pets displaced by the hurricanes was an easy decision for her and the team at COIT. The AWA has partnered with three national groups in order to be a shelter that can take in animals that were displaced before the hurricanes hit. That then allows local shelters in the affected areas to be opened up for those pets being rescued to be housed locally so their owners have a chance to find them. Richmond estimates the AWA will have a total of about 100 pets come into their shelter this month. And when Richmond says huge, she means an entire trailer full of necessities to help the shelter take in these new displaced pets. That’s in addition to the $2,500 COIT donated to the AWA. If you have ever thought about adopting a pet from a shelter, both Richmond and Topiel agree that now—more than ever—is the time to do so. Richmond says knowing that they have an organization like COIT helping out in any way possible makes a difference for the AWA. Topiel has even donated COIT services to the AWA, helping to clean their air ducts, dryer vents and floors on a regular basis, and has organized fundraisers and supply drives as well. Published (and copyrighted) in Suburban Family Magazine, Volume 8, Issue 7 (September, 2017).